Better communication and lower costs are things that everyone needs, and medical institutes, doctors’ offices, and hospitals are no exception. VoIP systems bring improved sound quality, reliable communication lines, and a whole range of business tools and features that medical centers find very valuable. VoIP systems help hospitals and medical institutes enjoy better and more reliable communication, which in itself brings a whole range of benefits. With a good VoIP system, patients are able to speak to their doctor, nurse, or medical practitioner faster without spending time waiting in call networks or facing the frustration of dropped calls. Improved communication means stronger relationships and trust between patients and doctors. By making it easier for patients to consult their physician remotely, VoIP services also help cut down on the number of patients who need to come in person to the medical center. Through VoIP, doctors and medical personnel can also collaborate more easily, leading to greater knowledge sharing, better diagnoses, and clearer medical decision-making. 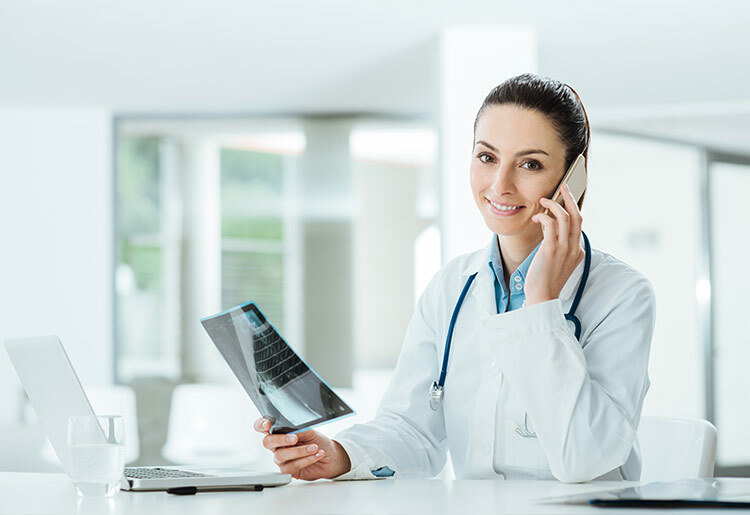 By improving communication between medical practitioners, VoIP services help make sure that doctors have all the information they need to prescribe the correct course of treatment. This reduces the number of potentially serious mistakes and life-threatening misunderstandings. An auto-attendant or virtual assistant can handle calls when there is no member of staff available and makes sure that each patient is directed to the right person. Fax-to-email capabilities enable practices and medical centers to receive and respond to faxes even if there is no fax machine on site. Encryption and other security features protect patient confidentiality and make it easier for medical practitioners to collaborate securely and remotely on a case. Voicemail to email, either in the form of a voice recording or as a transcribed text, ensures greater efficiency in replying to voice messages. Find me/follow me features allow doctors to receive phone calls from patients, consultants, or other medical services even when they are working in a different clinic or are away from their desks. Call routing makes it easy for medical personnel to transfer incoming calls from one department to another in a busy hospital, or to set multiple extensions to ring at the same time. Group paging permits hospital administrators and medical secretaries to deliver mass announcements across a number of telephones at once to speed up response time and ensure that the message is received. The best VoIP solution for your medical institute or hospital is going to depend on a number of factors, including which features you need the most, how big your institute is, and what kind of software or hardware you already have. Here are the top five VoIP providers for medical institutes and hospitals. Vonage Business is one of the best VoIP providers for medical institutes and hospitals, thanks to its impressive cost savings and extremely good call quality. On average, users save 36% on call costs by using Vonage Business. A powerful mobile app that integrates directly with the Vonage Business account so that doctors and medical staff can make and receive business calls from their smartphone from within the app. Multiple integrations with 3rd-party apps enable better synchronization of patient information. A cloud-based model means that doctors can access full patient information from any device so that they can be fully informed when they answer patient questions from anywhere. An auto attendant (called a ‘virtual assistant’ by Vonage Business) that routes calls to the right individual or to an entire department. Group paging – also known as hunt group – so that medical administrators can contact multiple personnel at once. Video conferencing, call bridging, and audio conference calls for better communications and knowledge sharing. Voicemail support including voicemail to email. RingCentral is another leading VoIP provider with many features that are vital for hospitals and medical institutes. It already serves over 350,000 businesses thanks to the extensive features, sophisticated PBX solution, and easy scalability. An effective mobile app that allows doctors to receive and make calls on their smartphones so that they can respond to patients even when away from their desks. Unlimited video conferencing and audio conference calls to encourage greater collaboration between medical personnel. Multiple integrations with 3rd-party apps that include Office365, NetSuite, and Outlook so that physicians and nurses can always access the identity and relevant details when they answer calls from or about patients. Easily scalable for doctors’ practices and medical centers that intend to expand. Excellent customer support that helps solve user issues quickly to reduce downtime. Call trees and call routing that makes sure that every patient who calls is answered by the most appropriate person for their situation. Hunt groups–group calls–to alert several doctors to a situation or pass on important messages all at the same time. Easy setup and system management so that even small medical centers that don’t have a dedicated IT department can utilize the system. As a hosted cloud-based VoIP provider, 8x8 is another popular option for medical institutes and hospitals of all sizes. 8x8 charges reasonable rates and includes many useful features. Highly-secure encryption and protection, which keeps patient data and personal information safe from hackers and cyberthieves. Medical personnel can chat securely so as to collaborate on difficult cases. A very easy to set up and operate VoIP system which can be managed without difficulty, even by medical staff with little IT experience, ideal for small practices without an IT department. Multiple 3rd-party app integrations to allow seamless connection with tools that include Outlook, Smartoffice, and NetSuite, so that medical practitioners can access patient details and extended caller ID no matter where they receive the call. Video conferencing to promote collaboration and knowledge sharing. Voicemail-to-email feature that makes it easier to keep up with voice messages, especially at busy times. Ring groups to transfer a call to multiple extensions at the same time, so as to increase the chances that it will be answered. Auto attendant that handles initial calls and redirects them to the relevant extension. Handy mobile app that enables medical staff to make and receive professional calls from within the app. For smaller medical centers and doctors’ practices, Grasshopper provides a call answering solution with plenty of business features for a low cost. While it’s not technically a VoIP provider since it doesn’t offer outbound calls, Grasshopper does provide many important features for hospitals and medical institutes. Low-cost pricing plans that don't require any additional hardware, thus saving money for small medical practices. Extremely easy setup and call management so that even small practices without an IT department can set up and maintain the system. Auto attendant to provide out-of-hours call handling as well as clear, professional call directing to individuals or departments, so as to avoid frustration from patients or employees who can’t reach the right person. Simple call transfer and call routing features to help everyone access the medical practitioner or staff member they need. Find me/follow me capabilities so that doctors can receive important calls from patients and colleagues when they're away from their desk or at a different location. Voicemail-to-email feature covers both voicemail recordings and voicemail transcriptions, making it easier for medical practitioners to keep on top of important voice messages. Receive faxes as emails so that vital information doesn’t get lost in the fax system. Toll-free, local, or vanity numbers included in the cost so that patients can get in touch more easily. A powerful mobile app that permits split calls, location-based rule calls, conference calls, chat, and blind and warm transfers so that medical practitioners can handle calls when they are away from their desks, working in a different clinic, or on the move. Voicemail-to-email feature that sends voice messages in an email attachment as a recording, so that physicians can keep up with voicemail. Extremely easy platform to set up and maintain which helps even medical practitioners without any IT experience handle calls efficiently. Find me and follow me capabilities to ensure that important calls from colleagues and patients alike get answered by the right person, even when you are away from your desk. Unlimited direct integrations that include the ability to access patient details from any device so that doctors can give informed opinions and answers over the phone. Conference bridge to use for conference calls with up to 10 participants for better collaboration. Unlimited auto attendants to direct calls to the right destination every time. Time-based routing and custom schedules to cover every time of year, including weekends, holidays, and early closing days, etc. VoIP systems can help cut down on communications costs for medical institutes and hospitals in a number of ways. By removing the need to pay for an extra, dedicated phone line, doctors’ practices can save money. Calls made through a VoIP system, both locally and nationally, usually cost less per call than they would on a landline. By enabling video conferencing and audio conference calls, VoIP systems reduce the costs of holding in-person meetings. Transportation costs, the price of maintaining or renting meeting facilities, and general meeting costs are all decreased drastically when you can hold a virtual meeting instead. There are also other important costs that are not as easy to measure which are reduced by a VoIP system. These include the cost of malpractice suits due to miscommunication, the effects of a frustrated and angry patient who can’t get through to his/her physician, and the overall greater efficiency that comes with better knowledge sharing. Along with other cutting edge technology, VoIP is part of a wave of change in medical institutes and hospitals. Secure cloud-based VoIP communications mean that doctors can access full patient data immediately, no matter where they are or where the data was originally gathered. As reliability has increased, VoIP solutions are able to provide communications services that have barely any downtime, lower latency, and better sound quality. Follow me, call transfer, and call routing features mean that hospitals can leave behind the frustration of not being able to contact a given doctor or nurse because he/she is not at their desk. Better virtual communication also enables doctors and other medical practitioners to meet to share knowledge, discuss difficult cases, and prepare case studies much more frequently, which raises the standard of medicine everywhere.